Used B2710HST 4wd 27hp desiel tractor with 119 hours of operation. HST transmission, power steering, four wheel drive with locking rear dif, intelli display, R4 industrial tires, Mid and Rear PTO's, ROPS safety system and LA402 front loader with 60" bucket + toothbar (loader will lift 900lbs to top, 1800 lbs tipping load). 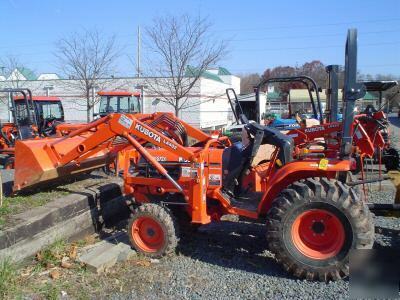 Full specs listed at www.kubota.com. Any questions please contact Tom Martin at .